"I swear we're not crazy," begins the first post published in the Midwest Wanderers' blog. 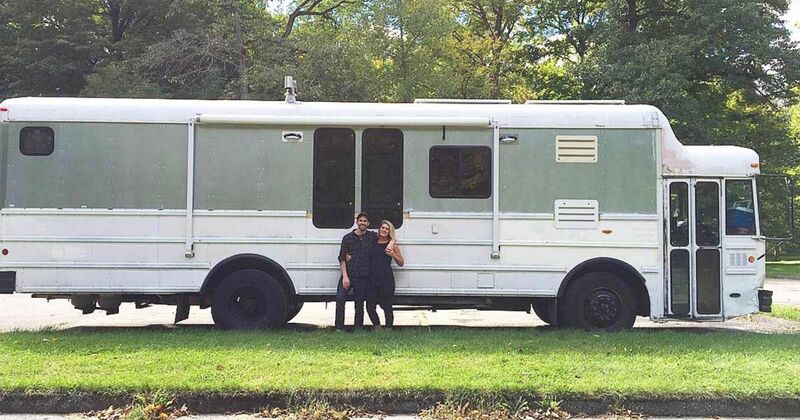 Hailing from Oswego, Illinois, high school sweethearts Luke and Rachel Davis quickly became smitten by everything that comes from the Skoolie lifestyle. From the freedom to explore the open roads to the noble notion of foregoing the frivolous luxuries of the daily grind, the more they talked about the simple pleasures that come from a completed bus conversion, the more they wanted in on the action. So they took a chance, and their wandering feat eventually came to fruition. For those who never considered packing up and going on a converted bus adventure, Luke and Rachel's decision could sound like something out of la-la land. But for us? Not the slightest! If anything, we're inclined to live vicariously through their journey. The adventurous couple bought their bus in September 2015, and their plan of action was to make their mobile home road-ready by the following summer. Eventually, their bus took on a life of its own, becoming a fully livable, solar-powered motor-home. The exteriors are quite interesting, don't you think? You can tell that Luke and Rachel made the bus a bit higher to give them more room to be creative without straying too far away from that quintessential Skoolie look we all adore. While the outside appeals to rustic conventions, the interiors are much more refined. We don't usually see a kitchen precede the living room, but this works really well in the Midwest Wanderers' bus. No clutter here! The beaming cabinets, elegant counters and sleek appliances have been fitted in a way that maximizes the space confinements. ...and the essential fueling compartment that keeps this Illinois native nice and cozy. At the end of the day, the Davis family can opt to dine in a polished wooden table akin to the cottage-like interiors. Or they can simply walk up the stairs and call it a day. The bedroom wraps up our tour with a delicate tiny house touch -- a "sleeping loft" that proves this converted bus is not afraid to be a little bit different. Even though their four-month stint in Colorado has already come to a close, the Midwest Wanderers are already gearing up for their next adventure. With a beautiful bus conversion ready to guide them along the way, it's no wonder they're eagerly embracing the nomadic lifestyle. Simplicity has always been a strong appeal for container homes. Reining in on the finer details is always a given –but when sophistication is added into the midst, these become phenomenal creations.